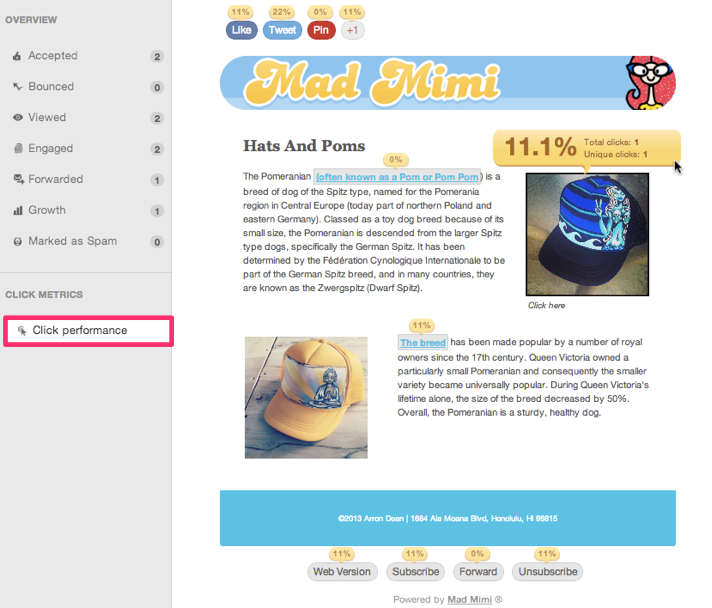 When you send an email campaign with Mad Mimi, you can always monitor the results to see how your mailing performed. These details make up your statistics. 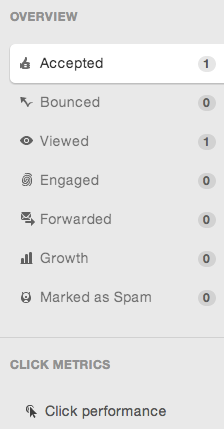 Here’s a quick summary of your email marketing stats in Mad Mimi. Click any stat type below for more details. The stats summary in the Promotions tab will show combined stats for every time the promotion was sent. Click the More Stats button to view detailed mailing results for your most recent mailing. Click any stat type to view combined statistics for all mailings of the promotion. Sent: These contacts were sent your mailing. If the numbers are not want you expected, review our guides to exclude list and don’t resend. Accepted: These contacts received your email successfully, but we have no other details. Bounced: These contacts did not successfully receive your mailing. Viewed: These contacts opened your email. Engaged: These contacts clicked a link, or shared your email using forward to a friend, or a social share button. Forwarded: These contacts forwarded your email to a friend. Growth: Measures the total new subscribers and unsubscribers that resulted from your mailing. Unsubscribed: These contacts unsubscribed from your list. Marked as Spam: These contacts reported your email as spam in their inbox. Click performance visually maps the strength of each url in your promotion. Mimi will distribute the total number of clicks for a specific mailing over all active links in the promotion. Each url will show the total percentage of all clicks it received, along with the unique and total click counts. Click the compare stats button at the top of the dashboard to compare promotion stats side by side. To view multiple mailings of the same promotion, Click All Sends at the top of any stats details page. How Do I View the Stat History for a Single Contact? How Do I Compare Email Campaign Stats? Do You Offer Advanced Stats Tools, like Google Analytics?